TL;DR? A shorter version of this post is published in the blog at Classoos.com. 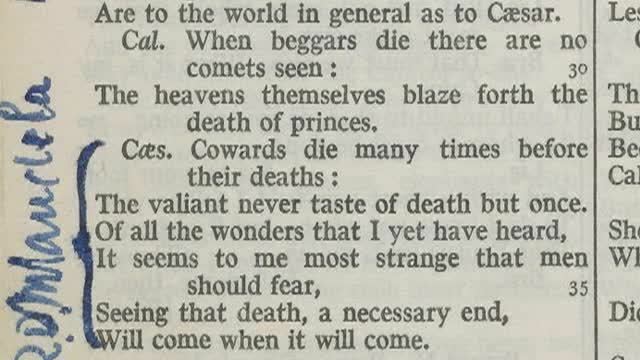 ‘Cowards die many times before their deaths’ is the opening of Nelson Mandela’s favourite passage from Shakespeare, an author who he loved, and used to quote from extensively. How do we know? Because he signed it in the margin of one of the few books circulated amongst the inmates during his 18 years on Robben Island. Thirty-two of his colleagues similarly annotated a textbook to indicate their own favourite extracts, and turning a cheap collection of the Complete Works into a powerful historical artefact. Scholia are grammatical, critical, or explanatory comments, either original or borrowed from pre-existing commentaries, which are inserted on the margin of the manuscript of an ancient author, as glosses. My daughter, currently at work on a doctorate which involves studying ancient texts, tells me she often has to rely on such scholia. In some cases the original works referred to in the scholia have long since disappeared, and if it wasn’t for the marginal mentions we wouldn’t even know that these works had existed. So, the scholiasts piecing all this stuff together really are just living on the margins. Clearly not every notation made in a textbook is a historical artefact, but nor are they all the acts of vandalism which many of us were brought up to believe. People have been writing stuff in the margins, often usefully, ever since other people had been writing stuff down. Medieval monks in the middle of transcriptions were prone to making their own additions to the literary works they were copying. Or in the margins of books their colleagues had carefully transcribed. The first example of ‘cut and paste’, spotted recently in a Florentine library, was made by a monk correcting a typo in such a manuscript. Not that Mark Twain was showing ‘the highest respect’ to John Dryden’s translation of Plutarch from Greek into English, when he added his own pithy comment about the ‘rotten English’. Mark Twain was another author who loved to annotate the books in his possession, and his many additions have now become an online library project, where all his marginalia, additions and underlinings are carefully catalogued. (https://www.nytimes.com/interactive/projects/documents/twain-books). So the use of ample margin space by the reader to add their own comments has a long and honourable tradition – just not in schools. And it can be found in all kinds of texts – Francis Bacon was another creative with a love of adding his own scientific ideas to a good wide margin as he went along. Indeed, it could be said that the lack of an ample margin set mathematics back several hundred years? In 1637 the mathematician Pierre de Fermat was reading a copy of Arithmetica, a work by Diophantus of Alexandria, making margin notes of his own thoughts and approaches. At a key point he claimed he had a proof to one of the unsolved problems, but that it was sadly too large to fit in the margin provided. Pierre then conveniently died without writing it down anywhere else, and kept generations of mathematicians busy thereafter, trying to work out the answer. Mind, Pierre had a bit of form when it came to this trick, and he claimed to have cracked a few others elsewhere as well, also without writing them down. But this last one was so tricky that it meant we had to wait till 2016 for someone else to come up with the solution. Meanwhile, “the margin wasn’t wide enough” has surely joined “the dog ate my homework” on the list of great educational excuses of all time. When it comes to the education of school or college students, I suspect few establishments approve of learner annotations in the schools valuable textbooks. However, there have been textbooks written about the art of reading that have even argued that writing in the book you are reading is not only useful, but indispensable! • Underlining (or highlighting): of major points, of important or forceful statements. • Vertical lines at the margin: to emphasize a statement already underlined. • Numbers in the margin: to indicate the sequence of points the author makes in developing a single argument. • Numbers of other pages in the margin: to indicate where else in the book the author made points relevant to the point marked; to tie up the ideas in a book, which, though they may be separated by many pages, belong together. • Circling or highlighting of key words or phrases. • Writing in the margin, or at the top or bottom of the page, for the sake of: recording questions (and perhaps answers) which a passage raised in your mind; reducing a complicated discussion to a simple statement; recording the sequence of major points right through the books. I use the end-papers at the back of the book to make a personal index of the author’s points in the order of their appearance. The front end-papers are to me the most important. Some people reserve them for a fancy bookplate. I reserve them for fancy thinking. Not a bad list, that is still pretty useful, though of course the invention of coloured highlighter pens means that different techniques could more easily be incorporated by today’s learners. But what happens to the value of your textbook once you have made it your own, Adler style? Education can be an expensive business, particularly when it comes to buying textbooks. Since an average US college student spends between $500 and $1,500 annually on course materials, this means a $10 billion industry, of which approximately $6 billion is reckoned to be spent on textbooks. It is not unusual for a lecturer to write their own textbook, and ensure that it is on the reading list for as many of their courses as practicable, and then sit back and get hefty royalties on top of their teaching salary. Especially expensive when you consider a particular textbook may only be useful for one term’s course, or at most a year. Educational publishers do extremely well in this landscape, and have been resistant to schemes such as textbook rentals, which are starting to reduce their extremely lucrative margins. (Add your own ‘ample margin’ joke here if you must). But change is coming…. Unsurprisingly there is a thriving market in second-hand textbooks, and even university bookshops, seeing their income declining, have started to offer ‘previously-loved’ books alongside the pristine new copies. Convention had it that these books were worth more in pristine condition, and prices were ranked accordingly. Then an observant bookstore worker at Stanford noticed another shift in the market… the second-hand copies were selling more quickly than the new books. And the less-pristine ones were flying off the shelves, ahead of the ‘as new’ copies. At first this was put down to the students being impoverished, so assuming they were buying the cheapest copies available. But then the bookstore staff noticed that students were checking the names of the previous owners inside the front covers, and were leafing through the textbooks looking at condition of the pages. The incoming cohorts had realised that some of the previous students made a habit of marking up their textbooks, highlighting particular passages that the lecturer had praised, or adding some of the lecturer’s comments in the margins, or even adding weblinks to relevant material online. So prospective purchasers were looking up the results of previous year’s classes, identifying which students had done well, and then were actively seeking out their second-hand textbooks in the hope that the annotations and additions would make their own studies that much easier and more productive. Far from decreasing the value of the books, the Stanford university bookstore now finds that they can add a premium to second-hand books that have been well-annotated by an able student from a previous cohort. So not only are marginalia interesting, they can add real value to the learner. And not only their own additions, the ideas of others can add even more value. Educators have not been slow to see the value of the potential for systematising the ability to share annotations and marginalia to aid learners. In “From Personal to Shared Annotations”, Catherine C. Marshall and A.J. Bernheim Brush speculate that the provision of new digital technologies will facilitate not only the increased use of annotation, as promoted by Adler and Van Doren, but also the sharing of such annotations digitally. What will it mean if every student in the cohort has access to a textbook marked up by the most able of students, not just the lucky first one into the bookshop? What if the text book could be issued already pre-annotated by the teacher, whilst the student retains the ability to amend or remove any such annotations to customise the text to their own particular needs? These do not need to be hypothetical questions. Systems like Classoos come with electronic texts and tools to make this possible today. Original texts and annotated texts can be seamlessly incorporated into a single system that the student can access at any time from wherever they are. Copies can be amended and shared, allowing all students to contribute, and to benefit from the learning of their mentors and peers. After all, isn’t that what good teachers have been encouraging students to do for years… just not in the school textbooks? A good teacher’s marginalia has often been a joy to behold, especially when trumping student graffiti. Living on the margins just got a whole lot more exciting. How to Mark a Book, By Mortimer J. Adler, Ph.D. Previous Previous post: Writing in textbooks (part 1): Critics or vandals?